She Wants: Madden Girl or Rampage Riding Boots? Last year, at the end of the winter season, I bought several pairs of boots. They were all faux sheepskin fur-lined boots. I wore my Bearpaw boots so much for two years that the sole began to crack and I had to reluctantly retire them. That was when I decided that I should have several pairs of furry boots in different colors so that I would not wear them out so quickly. What I had neglected to do was to buy a pair of dressier boots. I'm not talking about dress boots with heels, but something that is slightly dressier than sheepskin boots. A pair of riding boots would do nicely! Since I do not want to invest too much money in yet another pair of boots, I have been considering the Madden Girl Women's Zerge Boot (left) and the Rampage Women's Iben Riding Boot (right). 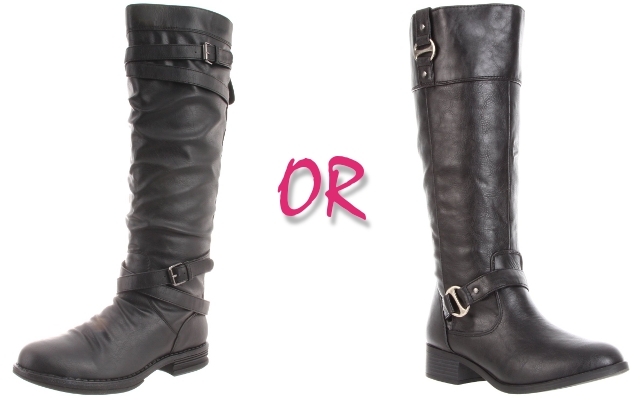 Both are made of synthetic leather, have a touch of hardware that I like, and are reasonably priced. The Rampage boots appear to look more like real leather and have a shine to them, so they look a little dressier. On the other hand, I like the wraparound detail on the calf and the ankle on the Madden Girl boots. They also look more comfortable to me because of the slightly slouchy trunk and the rubber-looking sole.